This serpentine bureau is composed of strongly figured dense Cuban mahogany. The drawer fronts are carved out of solid logs and all surfaces, i.e. the top and sides, are strongly figured and vibrant. (See attached images of the top and sides.) Newport tradition is quite restrained but magnificent in execution. Note the very fine Newport dovetails. The brasses are all original and the feet are quintessential Newport ogee bracket in its form. Many of these bureaus are quite large but this one, at 36 inches, is moderately sized. 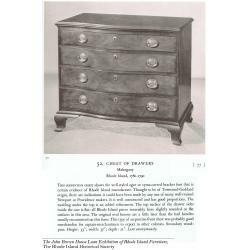 Attribution to John Townsend is discussed in Morrison Heckshire's John Townsend: Newport Cabinetmaker, NY Metropolitan Museum p.92-93. 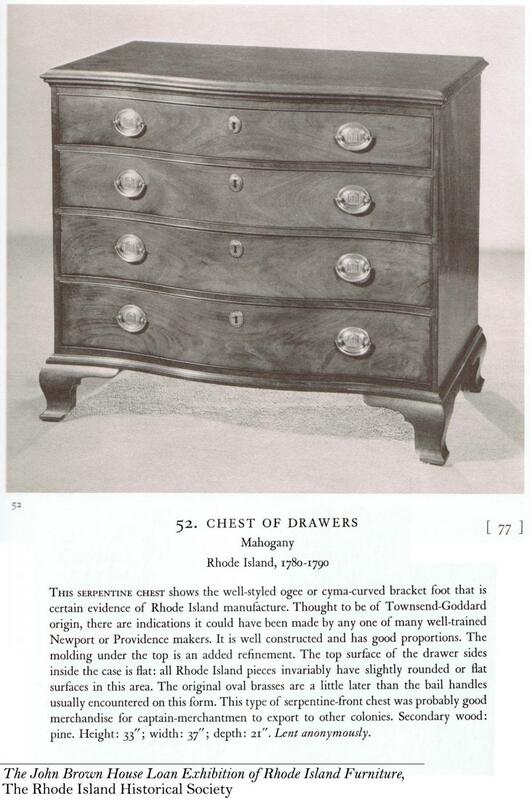 Furthermore, an almost identical bureau is illustrated in the Rhode Island Historical Society's John Brown Loan Exhibition, see attached scan below. Case Width: 35 1/4 in.